This is our own Silver Anniversary yarn kit with a free pattern designed by our own Bobbi IntVeld. 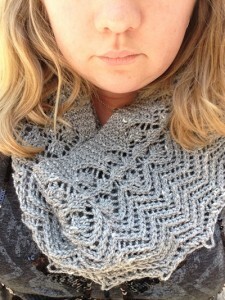 She has designed a lacy, unique pattern that can be a cowl or a scarf. The design takes only 2 hanks of the soft Acadia DK yarn by the Fibre Co. Acadia is a blend of silk, baby alpaca and merino wool. The kits sell for only $29.00. Supplies are limited.